← When Was The Last Time You Went For A Run Along The Beach? According to a Finnish study following 9000 British families with a minimum of one kid over a two year period. The study was looking at how much time the kids spent with their grandmother and the likelihood of the kids being overweight at the age of three. The study concluded that if kids see their grandmother on a daily basis, they are 22% more likely to be overweight when they’re three years old. The other kids in the study that didn’t spend that much time with their grandmother was in daycare or in kindergarden instead. This made me remember what a friend of mine who’s a teacher told me a while back; that she can tell who in her class has visited their grandparents the day before, just by looking at their behaviour. I link that to the video I posted the other morning, on how kids react to party food. Because at the end of the day, that’s what grandmothers often feed to their grandkids, party food. Food that they not necessarily get every day from their parents. Sweets that will make the kids love their grandmother just a little bit more, because they know that they will get chocolate when visiting her. Why is this? I keep saying grandmother, because traditionally in that generation, the women would do all the cooking and feeding, therefore they are still feeding their grandkids today. Most of our grandparents also remember what it is like not to have too much food and wants to make sure that their grandkids are healthy and get enough food. And you don’t throw away food, you finish what’s on your plate (I was taught this too, and I still finish what’s on my plate. The benefit now is, I usually plate up the food myself, so I don’t take too much), if not, you don’t get any dessert. Because obviously you’re full, so there’s no room for dessert (but you’ll get dessert anyway, grandma can’t say no, can she?!). It’s not the grandparent’s responsibility to raise their grandkids, so they spoil them instead. And what’s easier than to spoil kids with sweets, party food, ice cream, whatever the favorite is? So, the more time spent with grandmother, the bigger the chance of eating a lot of yummy stuff and getting into the habit of having party food on a daily basis. The study also shows that kids who are not spending time with other kids, move less. So, if your grandmother is looking after you and you are the only kid around, you will move a lot less than if you are in kindergarden with lots of other kids, running around all day. Grandma might not be fit enough to run around with you so it might get a little boring running around on your own. Therefore you’ll also burn less of the food your consume when you’re with her. I don’t suggest that you should stop letting your mum see your kids, but it’s an interesting study. And I am not very surprised by the outcome. 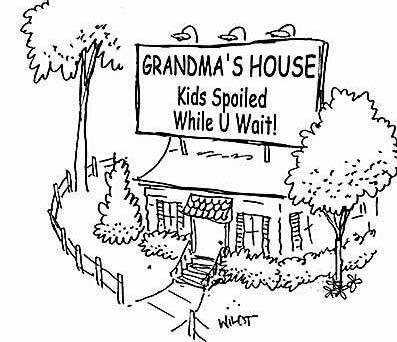 Of course grandparents wants to spoil their grandkids. It’s almost expected from them. But just be aware of what goes in your kid’s mouth every time you visit. It may have an impact on their eating habits and health for the rest of their lives. What we learn when we are kids is the ground rules. You’ll always remember it and a lot of it is hard to change when you grow up. Healthy eating habits should be taught when you’re young and should stay with you for life. That’s why we should bring the kids into the kitchen and let them help when cooking (yes, it’s messy, but that’s ok). Maybe that can be the fun thing at grandma’s house too, she has (probably) been cooking a fair bit in her life and she should teach her grandkids some of her tricks. It just doesn’t have to be chocolate cake every time. If you’re interested in reading the full research article, you find it here. This entry was posted in Food and tagged Children and Obesity, Chocolate, Does kids get fat when spending time with their grandparents, Eating Habits, Fat Kids, Food, Grandmother, Grandparents, Healthy Lifestyle, Obesity, Opinion, Overweight Kids, Parenting, Spoiled, Study, Sugar. Bookmark the permalink. Excellent lol! I always have that back wish in my head hey mom your wonderful and all but why will you NEVER watch our kids?! Seriously no offense to mine or my mom but they are like terrified they will get hurt or just too lazy they just won’t lol! But, this is all true making me feel better that they don’t watch there dang grandkids! I do agree with this but it is also a fact that grandparents have a right to consume the time with their grandkids. 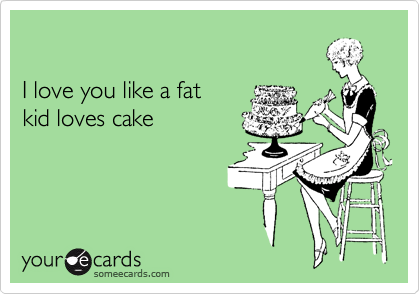 My mother keeps feeding my daughter cake, and I try to explain to her that fruit is just as good. My daughter hasn’t even started asking for sweets yet, so there’s absolutely no reason to feed her that junk. I think feeding kids candy is a typical example of how we transfer our own ideas of what tastes good to others. My grandmother deliberately tried to fatten me when I was a kid. For her generation being thin was a sign of bad health. Times have changed. Now it’s the other way around, my daughter is teaching me that melon tastes better than candy. I love it. That sounds good. It kills me too, watching babies and kids being fed sugary stuff, when they don’t even understand what it is! My daughter’s grandmother gave her two pieces of pie yesterday. My thoughts were a) how can you give a 9 year old two pieces of pie? and b) why wasn’t I given ANY?